A new leader in the race for the best! In parts 1 and 2, I mainly wrote about larger, better known khao soi places. I wanted then to try some lesser known or smaller neighbourhood shops. Unfortunately, the first couple of neighbourhood places I tried turned out to be disappointments, because of poor quality ingredients or indifferent flavour. They did not seem worth writing about. Then I heard of two recommended places, one from a friend and one from a reader. My friend suggested Khao Soi Mae Sai, which is off Huay Kaew Rd, a short walk past Nakornping Condo, the 15 story condo building almost opposite to Kad Suan Kaew shopping centre. The address is 29/1 Ratchaphluek Rd. It is a real neighbourhood place in a small shop house, but neat inside. I went with a group, both Thai and farang, the others of whom had eaten there previously. We tried different meats. I had the beef. The khao soi was attractively presented, and the flavour lived up to the looks, with a tasty curry/coconut broth, plenty of tender beef, and some of the best, really crispy, noodles on top. I rated it as equal to my previous top pick for khao soi, Khao Soi Samoe Jai. The Thais in the group rated it even better. Khao Soi Mae Sai is clearly a real find, particularly if you are looking for authentic, tasty, well presented khao soi in this popular area. A reader, David, e-mailed me to say that he has lived here for more than 20 years and recently tried khao soi at Satesinlp, which he strongly recommended. I decided to try it for myself. The first thing that impressed us was the nice building, and the attractive landscaping around it. I hope you can see what I mean from the photos. 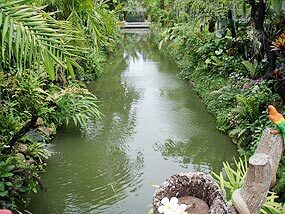 The building is surrounded by ponds and plants, including quite a number of orchids blooming in the trees. Inside, it is very neat and appears spotlessly clean. 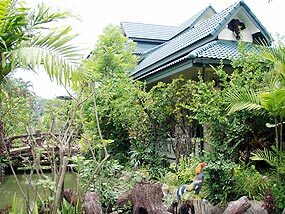 This is a place you could happily take your persnickety maiden aunt to try khao soi - assuming you have such an aunt and unless she objects to brightly painted plaster birds - there are quite a number dotted throughout the garden! Satesinlp serves not only khao soi, but is also a regular restaurant with a wider menu. However, khao soi is a particular speciality. Khun Sate, the owner, describes how he got a special recipe and was taught how to make it by the owner of a khao soi shop that had been open for almost 80 years. Most of the tables are on shady terraces, overlooking the garden, but there is also an air conditioned room upstairs. Air conditioning has to be a rarity for a khao soi restaurant. Yet the price of khao soi is within the range of “regular” places that I am including in this series of reviews - at 35 Baht for a bowl of meat khao soi, it is not very much more than you would pay at any roadside stall. We started with satay, tasty and nicely presented, and then tried both beef and chicken khao soi. I liked the tender, flavourful chicken, but the beef, which was so tender it almost melted in your mouth, was even better. The flavourful, thin curry/coconut broth was spicy, but not too hot. My northern Thai companion added chili to his taste, but I was happy with just a squeeze of lime juice. The pickles had an appetizing, slightly hot flavour, and the whole was topped with very good crispy noodles. After we ate, our waitress, who incidentally spoke good English, brought us a cup of fruit tea - a delightful end to the meal. Overall, this was the best khao soi I have had so far in Chiang Mai. The combination of this with the charm of the restaurant and the reasonable prices easily makes Satesinlp the leader in the race for best khao soi. Indeed, the place has so many positives that I think it is going to be really difficult to overtake! Thank you, David, for the suggestion. The address is 15/1 Sankamphaeng Rd. (on the main road which leads from the Thapae Gate out past the railway station, towards Sankamphaeng). The restaurant is outside the Superhighway and the inner ring road, but inside the outer ring. 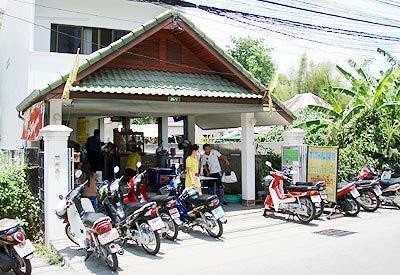 It is on your left as you leave the city, almost opposite a Caltex petrol station on your right, and just past Chiang Mai Leather. There is ample parking. It is open in the morning and afternoon only, closing at 4 pm. If you have a favourite khao soi place, please let me know at: [email protected] why you think it is one of the best - I hope to include further readers’ recommendations in a future article. This week’s recipe is for those who really enjoy the spicy side of Thai cooking. It calls for five hot chillis, but remember you can downgrade the thermo-nuclear side by lesser quantities. If you decide to do this, I would also recommend that you decrease the quantity of garlic cloves as well. This is a strongly flavoured dish, but is very easy and quick to cook. You can purchase the chicken from the supermarket already minced if you do not have a mincer in the home kitchen. In a mortar or food blender, mash the garlic and chillis. In the wok, heat the oil and add the pounded garlic and chilli and stir fry. When the garlic takes on a golden colour, add the chicken meat and continue stir frying, turning rapidly. When the chicken is cooked, add the oyster sauce, fish sauce, sugar, and chicken stock and stir again. Now add the basil leaves and coriander and continue stirring for one minute.